My sister, Karen, from the Northwest is coming for a visit so I am making a nice dinner for her. We Luecks really love two things when we get together, lamb and salmon. This time I decided to make salmon. 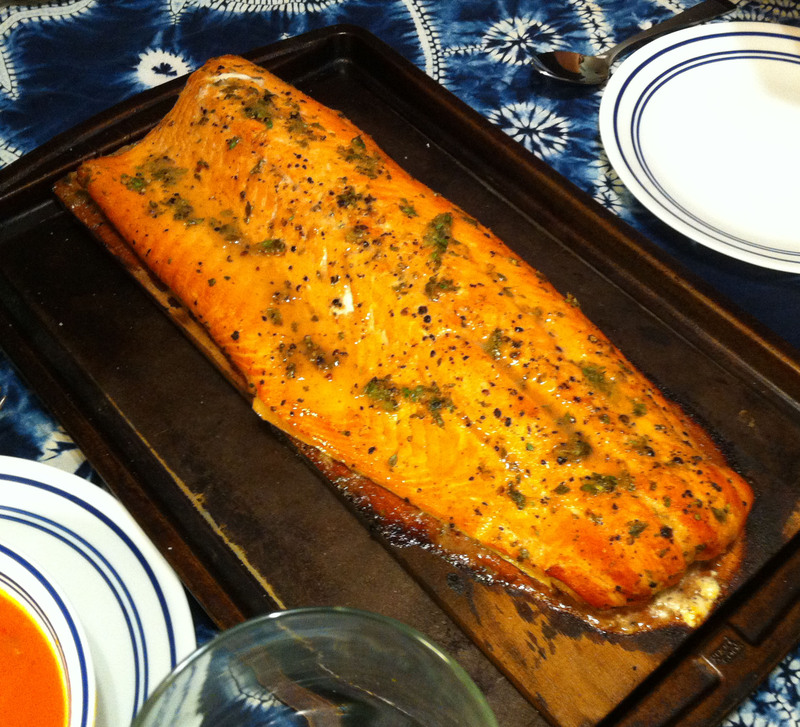 A few weeks ago I made a broiled honey lemon glaze salmon that was really nice. I decided that a variation using Irish whisky and a BBQ would be even better. In the Northwest it is not lamb, but salmon in Paradise. After Dinner Note: I had planned for this to be the star of the meal, but it was over shadowed by the soup. While this was a perfectly good salmon, tender and juicy and flavorful, it found itself playing second fiddle to the Italian meatball soup. 1. Start a chimney of charcoal in your barbeque. So that it will be ready to cook in half an hour. 2. Soak a cedar plank to lay the fish on while barbequing. 3. Pat the filet dry and sprinkle evenly with pepper and salt. 4. Pour ½ cup of whisky in a shallow tray and lay the salmon flesh side down in the whisky. Marinate for 15 minutes. 5. Mix the remaining whisky, lemon juice, honey, zest and thyme in a small cup. Tip: Warming the honey, 15 seconds in the microwave, will speed up its dissolving into the lemon juice. 6. Remove the salmon from the whisky and lay it on the cedar plank, flesh side up, in a large lipped tray. Tip: Add any whisky remaining in the tray to the glaze and mix well. 7. Spoon the glaze over the salmon and then drain the excess that comes off the fish back into the cup. Tip: Much of the herbs will stick to the fish, but about half of the lemon and honey will run off into the tray. 8. Spread the coals out against the back of the barbeque, leaving the front of open. 9. Put the cedar plank directly over the coals and close the barbeque cover. Open any vents so that you have good air flow and a high heat. Tip: Wash the tray for possible later use. 10. After 15 minutes, move the cedar plank to the front of the grill, away from the coals. Brush the salmon with the glaze and close the lid again. 11. Continue barbequing the salmon, basting every 5 minutes, until the top of the fish is just starting to char and salmon flakes easily. Tip: How long this will take depends on the heat of your coals and the thickness of your filet. Stick a fork or knife into the thickest part of the fish and twist slightly. If it is cooked through it will split along the flake lines. If it is underdone there will be raw fish exposed when you do this. 12. Transfer the cedar plank to a serving platter and spoon any remaining glaze over the fish. Tip: If you do not have a platter big enough to hold the cedar plank easily, use the baking tray as a base. 13. Cover the fish with foil for 5 minutes to finish cooking the salmon and to keep it warm.